San Diego, CA (March 26, 2013) – Proof positive that black wings of vengeance never cease their flapping, James O’Barr is back with another taut, dark The Crow series, THE CROW: CURARE. When retired cop Joe Salk can’t shake a little girl’s unsolved murder, his life unravels. Alone in the shambles of his former life, his obsessions with justice and revenge his only propellants, the shadowy spirit of vengeance, and the young victim reach out to him. Over three-issues this June, fans will see just how well The Crow’s supernatural heat can thaw a cold case. 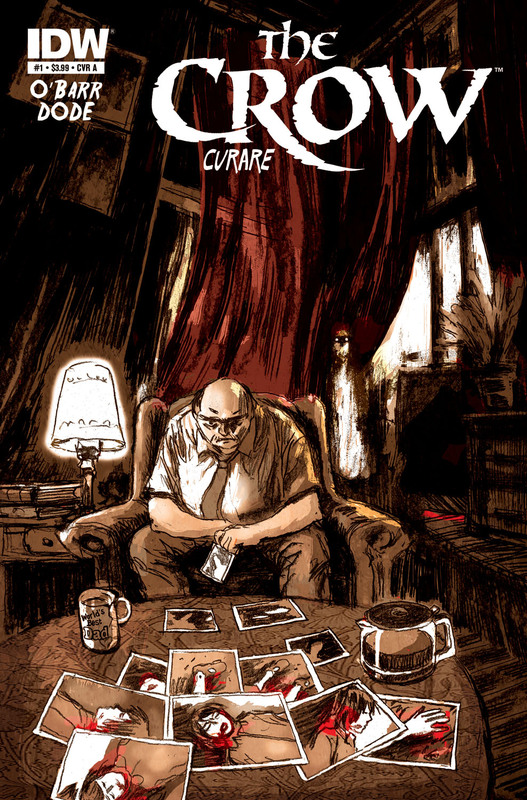 Written and lettered by O’Barr, featuring art by Antoine Dodé over O’Barr’s breakdowns, THE CROW: CURARE is bathed in furious darkness, but maintains The Crow’s signature quest for solace and hope. Issue one will feature a painted wraparound cover by O’Barr, as well as covers by Dodé, and painter Miran Kim, too. This entry was posted in Columns and tagged antoine dode, chris ryall, curare, idw, James O'Barr, miram kim, the crow. Bookmark the permalink. Follow any comments here with the RSS feed for this post. Post a comment or leave a trackback: Trackback URL.